Issue 8 of Steppe includes a number of articles of special interest, notably Thomas Loy’s account of the Yaghnob valley, accompanied by 16 pages of stunning photography by Helen Bodian. Situated in a concealed valley between the Hisar and Zarafshan mountain ranges about 60 km north of Dushanbe in Tajikistan, the Yaghnobi people have survived with their own language which is closely related to the pre-Islamic Iranian language Sogdian. In the early 70s, however, the entire population was forcibly resettled in the plains to work on cotton plantations. A comparatively small number of families subsequently returned to their homeland, but today there are only 400-500 Yaghnobis living in the Yaghnob valley. 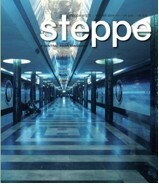 This issue of Steppe also includes an interview with Carla Grissman who went to Kabul in the late 1970s and stayed there for two decades working at the National Museum, and articles on the Tashkent metro, and the extinct Caspian tiger and its close surviving relative the Amur tiger from Siberia.